The General Assembly begins the final week of its 90-day legislative session today. Some big issues (transgender rights, modification to the estate tax, dog bite liability) have been resolved — at least legislatively — or are about to be. Others (limit on fracking, repeal of the “rain tax,” decriminalization of small amounts of marijuana) are dead or unlikely. + Minimum wage. Gov. Martin O’Malley would like to end his gubernatorial career with one more progressive win: a $10.10-an-hour state minimum, but the bill has been stalled by Senate Finance Committee Chairman Thomas M. Middleton’s demand that it include a pay increase for people who work with the developmentally disabled. + House of Cards. 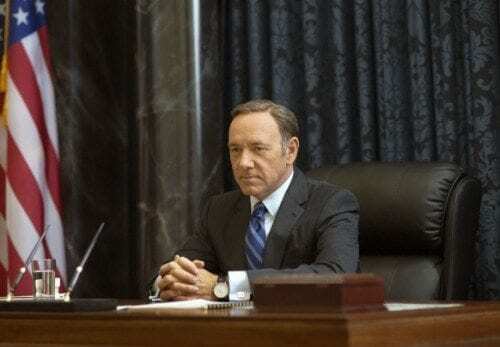 The House of Cards people have threatened to move production of the highly-rated Netflix series out of Maryland unless tax breaks increase dramatically, and the Senate and House have two completely different ideas about how to handle that. The Senate prefers total appeasement in the form of an $18.5 million tax credit. The House is currently bent on not looking like pushovers, offering an $11 million tax credit but adding a threatening amendment that would allow Maryland “to acquire the assets of a production company that has received the tax credit but abandons the state.” Yeah right. + Medical marijuana. The Senate and the House have passed “significantly different” medical marijuana bills. There’s plenty yet to work out, regarding the number of growers and distributors allowed in the state. + Speed cameras. Lawmakers are considering a bill that would restructure speed camera operations to try to ensure accuracy and assign more accountability to the contractor. The bill would fine the contractor for erroneous violations and make the bounty system — in which a contractor is paid more the more tickets issued — illegal. It would also create a more streamlined grievance system, with a person in local government assigned the task of reviewing complaints and voiding false citations. Fingers crossed! + Bail reform. It’s the least talked about, but it could be “the most difficult issue of all.” The General Assembly is under the gun “to comply with a decision that defendants have a right to a lawyer at all bail hearings,” which means they need to revamp how we decide who is held in jail while awaiting trial and who is freed.